Jay Paterno is the son of Joe Paterno and was on Penn State's coaching staff for 17 seasons, 12 of which he served as the quarterback coach. He is a writer whose work has appeared in numerous publications, including the Centre Daily Times, the Penn Stater, and USA Today. His columns for StateCollege.com have been cited by Sports Illustrated and ESPN. He lives in State College, Pennsylvania. Phil Knight is the cofounder and chairman of Nike, Inc. and one of America's most well-known entrepreneurs in the sporting world. Nike is the official athletic supplier of Penn State football's jerseys and shoes. He lives in Beaverton, Oregon. For people around the world football fans and non football fans alike, the name Joe Paterno is unjustly linked to scandal. What many fail to recall is the career of one of the greatest college football coaches of all time. As head coach of Penn State from 1966 to 2011, Paterno lead the team to five undefeated seasons, two national championships and received the honor of being inducted into the College Football Hall of Fame in 2007. One scandal fueled by constant media attention obscured many of these accomplishments, and in just one moment the memory of a man was altered. It is an epic saga of a big life that left life lessons in its rise and to its end. 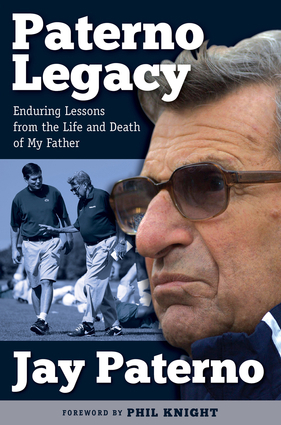 Whether you are a fan of Joe Paterno’s coaching or simply curious as to the events surrounding the scandal, Paterno Legacy: Enduring Lessons from the Life and Death of My Father, is a must read for all college football fans that communicates a side of the scandal that was largely ignored. Jay Paterno is the son of Joe Paterno and was on Penn State's coaching staff for 17 seasons, 12 of which he served as the quarterback coach. He is a writer whose work has appeared in numerous publications, including the Centre Daily Times, The Penn Stater and USA Today. His columns for StateCollege.com have been cited by Sports Illustrated and ESPN. He lives in State College, Pennsylvania.